My sixth graders love graphic novels, so it has been a pleasure and a relief to find so many wonderful new examples of this genre being published all the time. Comics Confidential: Thirteen Graphic Novelists Talk Story, Craft, and Life Outside the Box, compiled and edited by Leonard S. Marcus, interviews thirteen graphic novelists to discover their creative journeys and inspirations in this particular genre, which makes for fascinating reading. I love the potential for experimentation, all the different ways you can combine words and images. I like the different types of pacing you can have: the expanses of space and time, and the moments of silence and great action that you can fit into a single page.It’s a very versatile form. The text and images can be paired to tell the same story in two completely different ways, or they can tell two different stories simultaneously. This would be a wonderful book to share with students at the very beginning of the school year, when students explore genres even as they explore their classroom libraries. I also loved the rich insights these authors shared about how other aspects of their lives (race, culture, etc.) influenced their artistic directions. Pete Seeger was a national treasure, both for his music as well as for the spirit of social justice which infused all his songs. 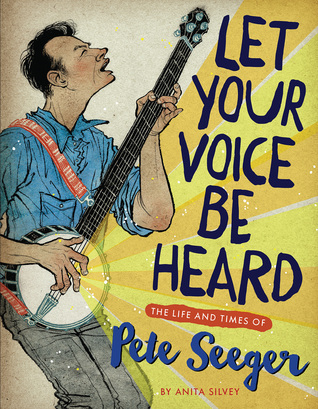 In Let Your Voice Be Heard: The Life and Times of Pete Seeger, Anita Silvey tells his remarkable story in a well researched and engaging way. I was always impressed with the way Seeger looked past his family’s economic and social privileges to identify, instead, with those who were in need. Many photographs and interviews help to place Seeger at the crossroads of every civil and environmental movement over the course of the many decades of his life, movements that fueled and gave purpose to his songwriting. I love that Silvey included Seeger’s work in cleaning up the Hudson River, because I have spent many a memorable June at the Clearwater Festival, contributing to and rejoicing in the work of restoring health to the Hudson River again. Reading this book brought back so many wonderful memories of activism and music that all seemed to feature, somewhere, the tall and smiling figure of Pete Seeger and his equally memorable banjo. Pete Seeger’s book is terrific. Our family saw him here in Denver when the kids were young. He came off the stage and sang right to Nathan and Sarah, a very special memory. And thanks for Comics Confidential. It does sound good for examining alternate genres. What a nice thing for students to know. Thanks, Tara. Oh I know my 12 year old would LOVE Comics Confidential. He loves reading them AND writing/drawing them. I’m going to have to see if we get a copy in our area. I also am glad to hear there’s a biography of Pete Seeger. I just checked and we don’t yet have it, but we also take a while to get things in our neck of the woods. Thanks or sharing! I have to get Comics Confidential for my classroom. Thanks so much for sharing! I am most looking forward to the Pete Seeger book. We even have it in my library system, but I just have to find time to read it!